Entries are open for the Allerdale Chase Long O, which this year will be in the fells and woods around the stunning Ennerdale valley. Courses from 4km to 16km - you choose your challenge! 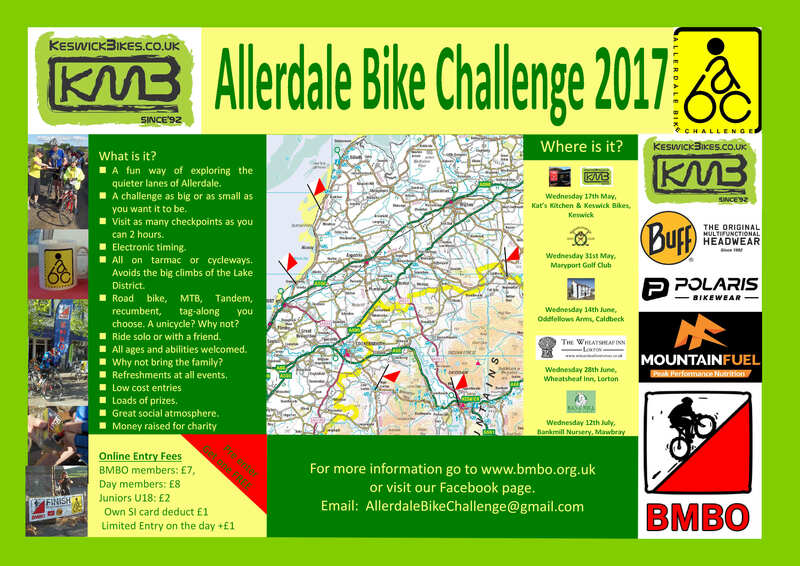 Pre-enter by Tues 13th June: email allerdale.chase@gmail.com including BOF and SI numbers and choice of course (very limited EOD). Taking the fortnightly Allerdale Bike Challenge which takes place on Wednesday evenings with the Thursday evening FootO events will give a combined series. Events will take place on 17/18th May and 31/1st May/June, 14/15th June and 28/29th June, with a prize giving after the 5th ABC event on 12th July. There will be trophies for first Junior boy and girls, and senior woman and man. Scores can count towards your individual combined league score even if you compete in a pair at the Bike O (courtesy of the magician/statistician!). Pre-entries for the Bike O are much preferred with limited entry on the day. Click here for the ABC Challenge Flyer.